Doctor Vee has an amusing article on his F1 blog, Vee8, at the moment, contributed by the Brits on Pole blog. This is a tongue-in-cheek look at possible developments amongst the teams and it is all sparked off by a rumor emanating from the McLaren Fans site. The idea is that McLaren develop two versions of their new car for 2009, thus giving themselves the opportunity to run one version on "Ferrari tracks", the other on circuits that have suited their car historically. That sounds like fantasy at first glance, the cost of developing two designs surely being prohibitive, but we are talking of the team that swallowed a $100 million fine and carried on racing at the front. Financially, it might be possible. Although the idea seems to have developed from the present suggestions that KERS could be on the cars at some tracks but not at others, there is more sense in having two versions than we might think. 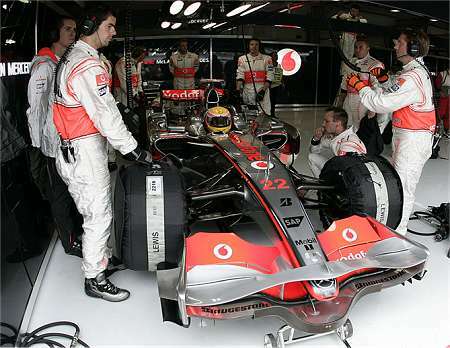 As we saw at the beginning of this season, Ferrari shortened their wheelbase to improve their car's agility on the tight circuits where McLaren had been better in 2007, while McLaren lengthened theirs to enable their car to compete on the quicker circuits. To have a short wheelbase version and a long wheelbase alternative would give McLaren the potential to be quickest on all types of track. And it is not as if it has never been tried before. In GT/Sports racing in the fifties, sixties and seventies there were manufacturers who produced short and long wheelbase versions of their cars. Admittedly, this was usually because the original model proved unsuitable for racing but the germ of the idea is there nevertheless. We should also remember that the pace of development in F1 is such that all the cars are very different from their originals by the end of the season. Sometimes mid-season changes are radical enough for the later version to be given a 'B' designation. So, it is a small leap to consider whether versions be designed for specific tracks, especially as Ferrari is leading the way by using their "hole-in-the-nose" tweak at some circuits but not others. In terms of competitiveness, it makes perfect sense for McLaren to develop two versions for a season, therefore. The question is, are they really so desperate to win the constructors championship that they would spend the huge sums of money this would require? You know, it is just possible that they might. They missed out narrowly on two championships last year, some would say they were robbed, and this season they are falling behind in the constructors' race. It has been a long time since they won anything and their frustration must be building to the point where they would try anything to guarantee a championship. Add to that the pressure from Mercedes (who are in the game to win) and it would seem quite likely that McLaren would try this solution, expensive as it is. I still doubt it, however, not least because the FIA would very likely find a way to ban the attempt. It would not be easy, unless a rule is introduced to fix the wheelbase at its original dimensions, but the FIA are known to ban things on the slightest of pretexts if they want to. There is no overseeing authority to call foul, after all. More than anything else, the story is made dubious by its appearance at this time; if McLaren were giving the idea serious thought, would they not do everything in their power to keep a lid on it until it is too late for other teams to respond? So I cannot put much credence in the idea, although it might start a few engineering heads thinking. And, if that does happen and the idea is picked up, McLaren Fans can turn around and say, "I told you so!" Nice one, gentlemen. Loved the Brits on Pole blog you referred to. Nice piece of work. It is only since the end of the turbo years that teams have only run one car design all season. It used to be common practise to start with the old car and switch to the new one 3 or 4 races in. Nelson Piquet at Brabham used to switch between a Cosworth powered car to a BMW turbo engined car depending on circuit characteristics. I really can't see why it would be difficult for McLaren to run two entirely separate designs. I can remember Lotus taking four cars to races where each driver's spare was an entirely different model to his race car. So the thing is possible, certainly. But Alianora's point about the rules makes it very risky to attempt using different versions, unless one were to separate the year into two - perhaps use a short wheelbase version until the French GP, then change to the long wheelbase for the rest of the season. I wouldn't be amazed if it's actually easier and maybe cheaper to design two or more different cars than one that needs to be able to handle all types of track. An amazing amount of the difficulty in engineering is trying to find the best compromise between a large set of conflicting options, and building multiple, largely different cars gets around that. It's probably still more expensive, but probably not nearly twice as expensive. That's a good point Ben. Last year there was a clear split with some McLaren circuits and some Ferrari circuits. THis season both teams have moved to a wheelbase closer to their rivals whereas what the really want is one short wheelbase car and one long wheelbase car. The only difficulty I can see is that with limited testing you could end up with neither car being sorted properly.